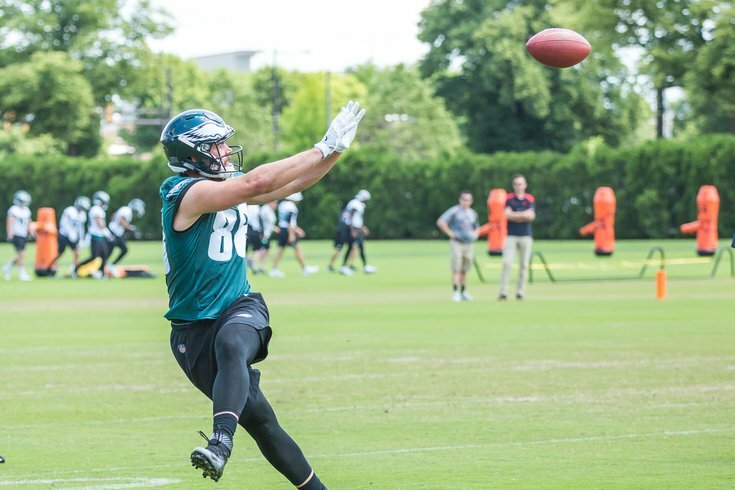 Dallas Goedert during OTAs at the NovaCare Complex. On Wednesday, the Philadelphia Eagles conducted practice No. 2 of a three-day mandatory mini-camp, before they break for the summer. As always, we have notes. • Though he's still only participating in individual drills and 7-on-7's, Carson Wentz had a really nice day. We've noted repeatedly how he can still put a lot of velocity on the football, but he has also gotten more and more accurate as the spring has progressed. While you shouldn't make too much of that throw, as Wentz was competing against air, the accuracy is most certainly also there during 7-on-7's. • While the Eagles may have the best 1-2-3 quarterback situation in the NFL in Wentz, Nick Foles, and Nate Sudfeld, the No. 4 quarterback, Joe Callahan, isn't too shabby either. I was talking with another reporter on the sidelines today, and we agreed that Callahan looks better than Chase Daniel, when Daniel was an Eagle. Daniel is the No. 2 QB in Chicago. I've been impressed with Callahan's arm strength, as well as his accuracy. In my view, he is a legitimate backup in this league, and I can't figure out why he chose to sign with a team that already has three locks at QB. • In around six or seven practices that have been open to the media, I have yet to see rookie tight end Dallas Goedert drop a pass. If you put the ball on him, he's catching it. Goedert also looks nothing like a rookie from a Division 1-AA school when it comes to route running. He has consistently gotten open, and he has one of the best route runners in the NFL (any position) in Zach Ertz to look up to in that regard. The real test for Goedert will be when they put the pads on this summer. Can he deal with a physical defense and still make plays? We'll see, but so far so good. • The play of the day was a Sudfeld deep corner ball to Bryce Treggs. Sud had great ball placement, and Treggs made a diving catch on the play. Treggs had big-time practices on occasion last year. He had another one of those today, catching passes all over the field. • Jalen Mills also had a great play today, as he was able to stay step-for-step with speedster Mike Wallace on a deep ball. Mills broke up the pass, and then showed off his patented finger wag. • I was asked in a recent Eagles chat if any of the players look noticeably bigger. After some consideration and observation, I'll note that Donnel Pumphrey does look bigger to me, as some other reporters have apparently noted. Last year he looked like a pip squeak. This year he looks more like a football player. Also, the already jacked-up Nate Gerry added even more muscle, it seems. • Gerry picked off Foles today, by the way. Foles never saw him and threw the ball right to him. Cornerback D.J. Killings also picked off Foles. Killings is a guy the coaching staff has mentioned previously. He got some slot corner reps today. Today was not Foles' best day. • Stop the presses! Isaac Seumalo got some work in with the second-team offensive line today at center. Previously, he was relegated to 7-on-7 "snapper guy" duty, because of an "upper-body injury," per Jeff McLane of the Inquirer. He airmailed a snap way over the head of Sudfeld, and was quickly replaced by center Jon Toth. • Kicker Jake Elliott got some work in today on field goals. He was 4/5. 39 - No Good. Barely missed wide left. Those hang times are not impressive. By comparison, when Donnie Jones was really banging them in camp, he'd be up over 5 seconds of hang time, occasionally getting up near 5.2. Additionally, the punts that went out of bounds went significantly out of bounds. Have you ever been watching a football game where the punter hits one way out of bounds, and the side judge walks up the sideline to mark the spot where it went out like he's the little Cliffhanger guy on the 'Price Is Right,' and you're rooting for him to stop? Anyway, that's not good. I think the Eagles need to seriously consider giving Johnston some competition.